It has been a busy week of conferences this week with a clear focus on adapting our cities for greater ecological (and human) health. The International Green Building Conference held in Singapore from the 1-3 September occurred simultaneously with the International Urban Design Conference 1-3 in Adelaide. Both conferences focused on adapting existing cities by introducing greater ecosystem services such as wetlands, forests and natural water flows that contribute to healthier urban systems. Meanwhile Singapore’s Building and Construction Authority launched its third Green Building Masterplan, dedicating more than $100 million to research and adoption of green building practices with a new focus on occupant behaviour. 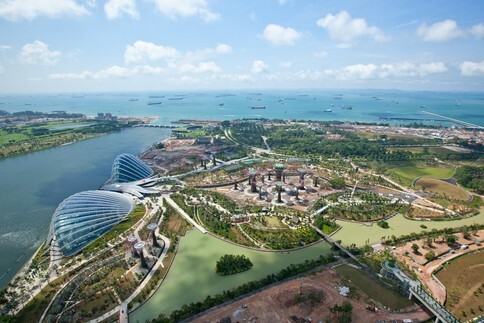 Initiatives under the Masterplan would induce green growth, attract investors and profile Singapore’s services and expertise on green building solutions for the tropics on an international stage. In Adelaide the conference stream of ‘Whole System Thinking’ placed an emphasis on urban forests, waterways and ecological planning for urban centres. An awareness of the constraints of current city planning is growing, particularly by regions experiencing large scale flooding, urban heating at significantly higher levels then peri-urban areas and the lack of cooling from tree canopies. Ian Shears of the City of Melbourne presented on ‘Designing the Biophilic City’ and the ‘urban forest strategy’, Mr Sasha Ivanovich, AURA Urban & Regional Alliance spoke on The Australian City in the 21st Century, and Suzette Jackson, Innate Ecology spoke on ‘Growing City Resilience: Integrating urban agriculture in the urban ecology’. City planning from an ecological framework provides regulating and provisioning services such as cooling of cities, fresh water and habitat for humans and the native flora and fauna. Both conferences contributed to the global discussion on adapting cities to regenerate natural environments and habitats for health. In particular the discussion on urban agriculture and access to nutritious healthy foods is seen globally as a critical issue with world population increases and climate change affecting the quality and quantity of food sources in future. Suzette Jackson is a director of Innate Ecology, working in strategic development, research and urban activation in city regeneration.